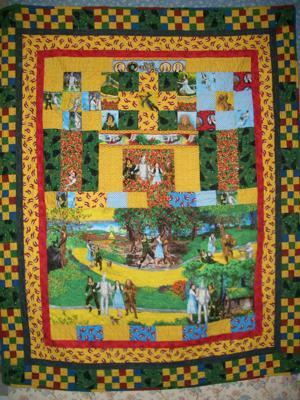 The third in my series of quilts depicting The Wizard of OZ continues with Dorothy, The Tin Man, The Scarecrow and the Cowardly Lion on the following the Yellow Brick Road. You can find the witch in many places in this quilt. My 3 yr old grandson loves to look for the witch when he naps with this quilt. The primary colors make this such a happy and child friendly quilt. We might even use this one for a picnic. My decision to add an elaborately pieced border was a lot of fun, especially since I just started strip piecing and cutting apart not knowing what I might do with the pieces. When I decided to alternate with the green and black witch patches I added the narrow black border and really liked it. Again these fabrics have been so much fun!!! Thanks Jackee for giving me a place to share them. Rose Ann, sorry I do not have a pattern for any of my quilts, because each one is a custom design. I let the fabrics speak to me as I lay them out and decide what goes where. Since I enjoy designing whether it be interiors, window treatments or quilts, I feel limited using a pattern. Therefore I have never even considered trying to form a pattern of any of my designs. I ask if there was a pattern for Collens follow the yellow brick road. I do not seem able to find the reply. Join in and write your own page! It's easy to do. How? Simply click here to return to Invitation for Quilt Pictures and Stories.